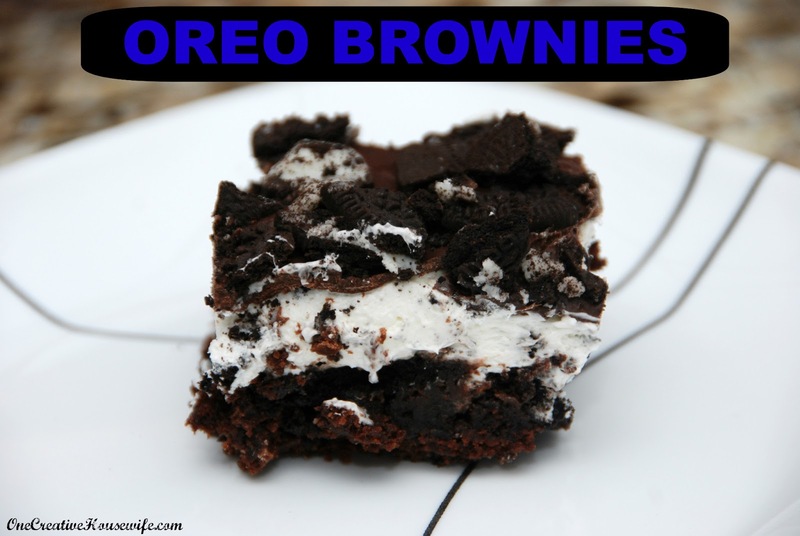 These brownies have been on my "must try" list for quite some time. Now that I've tried them I'm mad I waited so long to make them! They are a rich chocolaty brownie and the cream layer brings a great flavor to the entire treat. 1. Prepare brownie batter according to package directions, and fold in 1/3 of the chopped Oreos. I made them in a 9x13 glass pan. 2. Bake the brownies according to the package, until a toothpick inserted 1 inch from the edge comes out clean. 3. Allow the brownies to cool completely. 4. In a large bowl, beat the cream cheese and powdered sugar until combined. 5. Fold the Cool Whip and another 1/3 of coarsely chopped Oreos, into the cream cheese mixture. 6. Spread the cream cheese mixture on top of the cooled brownies. 7. In a microwave safe bowl, melt the chocolate chips and the vegetable oil on medium power for 30 second intervals, stirring in between, until melted. 8. Spread the chocolate evenly over the cream cheese layer. 9. Sprinkle the remaining Oreos on top of the melted chocolate. 10. Refrigerate for at least 30 minutes or until ready to serve. When serving, you may want to leave the brownies out until the chocolate layer softens a little. Otherwise when you cut it the chocolate cracks. 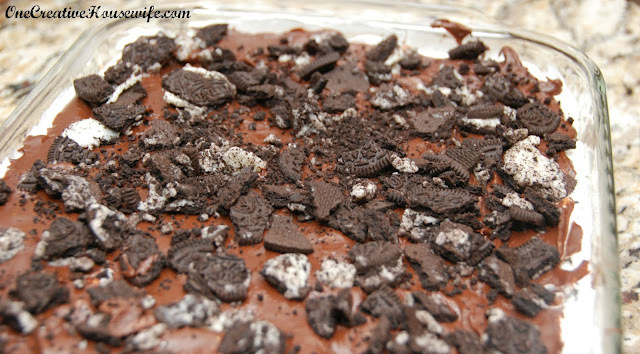 When I make these again I think I will leave out the chocolate chips all together, and just sprinkle the last 1/3 of Oreos on top of the cream cheese layer.